Sergeant Ted Regan has a problem. A son of one of the great corporate families, a Scion, has gone missing at the front. He should have been protected by his Ironclad – the lethal battle suits that make the Scions masters of war – but something has gone catastrophically wrong. Now Regan and his men, ill equipped and demoralised, must go behind enemy lines, find the missing Scion, and uncover how his suit failed. Is there a new Ironclad-killer out there? And how are common soldiers lacking the protection afforded the rich supposed to survive the battlefield of tomorrow? 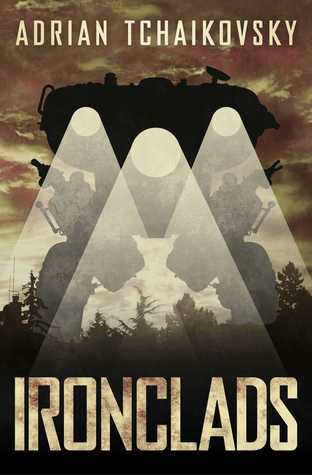 Ironclads is a military science fiction novella following an impossible rescue mission led by a couple of soldiers who don’t even know what they are fighting for anymore. Ironclads is set in a future where the war is now a playground for the rich kids. Think of it as the return of chilvalry: if you are rich, you have all the cool toys and armours to play with and kill a bunch of soldiers incapable of protecting themselves. You are a Scion, an unbeatable being. To be a Scion, you have to have money, which means that most of them are heirs of CEOs of huge corporations. Those corporations lead the world and decide who fight who. Serngeant Regan and his team have to find a Scion gone rogue, nobody knows what happened to him so they have to send a team to find out where he is. However, finding what happened to this Scion is not an easy-feat for ill-equiped simple soldiers especially when the Scion was last seen in the land of the enemies, here, the Nords. However, a job is job and we follow the (mis)adventures of Regan’s team as they travel in search of the missing Scion. In this future, the world is a complete mess: war is everywhere and boundaries are constantely changing. The UK is now part of the US after completely collapsing because of the Brexit. Discrimination and sexism are at the heart of this new civilization and corporations do whatever they please. I don’t want to go in too many details about this book as it is extremely short (only 200 pages!) but I have to say that a lot of things are packed into it. The worldbuilding is very detailed and the characters are multi-dimentional and complex. They know they are probably going to die on this impossible mission but we can understand their motivation to keep on searching for the missing Scion. By the end, I felt like I understood all the different players in this story and why they acted the way they did. It is really impressive to see how much every little detail is thought-out especially in such a short number of pages! I received a copy of this book from Netgalley in exchange for an honest review. My thanks to Solaris. All opinions are my own. Oh, this is one of my ARCs that slipped through the cracks, I must rectify that soon. I read Tchaikovsky’s Children of Time last year, and loved it. It was my first book by him, and I vowed I would read more! And with an interesting twist, to boot… We wantsss to read thissss, Preciousssss!